Will an Ectopic Pregnancy Decrease my Chances of Getting Pregnant? In some cases, the fertilized egg chooses another spot to implant, mostly the fallopian tube itself. Such pregnancies are known as ectopic pregnancies or tubal pregnancies. The implantation may also occur in the ovary, cervix, or abdomen but it is very rare. The biggest worry that women with ectopic pregnancies have is whether they can get pregnant again and whether ectopic pregnancy decreases their chances of getting pregnant. The answer is simple. You should make sure ectopic pregnancy is treated immediately, as early as possible, so as to not hamper your chances of getting pregnant in the future. The incidence of tubal or ectopic pregnancies is 20 in 1000. The main reason behind a tubal pregnancy is damaged fallopian tube, which hinders the entry of the fertilized egg into the uterus. It may also be oddly shaped and this can cause the egg to get stuck there. Infection or inflammation of the fallopian tubes can also cause ectopic pregnancy. Inflammation is caused mostly due to chlamydia and gonorrhea. There is another condition called endometriosis in which the tissue of the uterus doesn’t develop in the uterus but outside of it. If you suffer from this condition you are likely to have an ectopic pregnancy. Risk factors also include age and lifestyle. Those who are older than 35 are at a higher risk of ectopic pregnancy as are those who smoke. If you have had an ectopic pregnancy in the past, chances are that you might have one again. You should be aware of the symptoms of an ectopic pregnancy so that you can spot it early. However, some of these signs resemble the signs of a healthy pregnancy and distinguishing can be difficult. 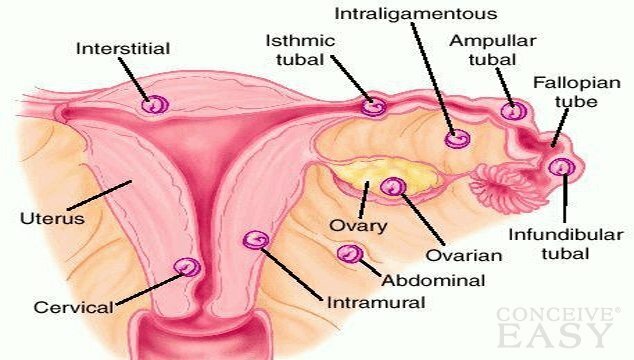 If you experience vaginal bleeding teamed with cramps in the pelvis or the lower abdomen, know that it is an ectopic pregnancy. If it is not treated right away the condition can get worse and the symptoms will become more severe. You will experience sharp pain not just in the abdomen and the pelvis but also in the neck and shoulders. You will also feel lightheaded and dizzy. You might even faint. Constipation is another symptom of a tubal pregnancy. If the tubal pregnancy is not detected, it can lead to dire consequences, which can be life threatening. The tube can also get ruptured if the ectopic pregnancy is not treated right away because the fertilized egg will continue growing. In this case there will be a lot of blood loss. If the pregnancy is treated late, you might end up being infertile because in most cases, a fallopian tube or an ovary is lost. Thus, early treatment is the safest option. A pelvic exam will show whether the pregnancy is normal or ectopic. If it is normal, the size of the uterus will increase. The levels of hCG or human chorionic gonadotropin will also be checked. If the levels remain the same for a long time, it can spell ectopic pregnancy as can the presence of a small uterus. Later, he will conduct a sonogram or an ultrasound to confirm. If it is established that it is an ectopic pregnancy, the tissue must be removed immediately. First of all, a drug named methotrexate is injected. This drug works to stop the growth of the egg. Then the egg is reabsorbed and the pregnancy is no more. If it is determined late, the ectopic pregnancy has to be treated through laparoscopic surgery. The chances of having another ectopic pregnancy are high but that doesn’t mean that the chances of having a normal pregnancy are zilch. You can still have a normal pregnancy. However, if the fallopian tube is damaged or has been removed, you might need to go for IVF or in vitro fertilization.